Yesterday, Monday 5 December, I did two City of Culture training events! 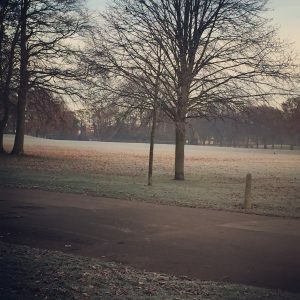 The first was a guided walk around East Park (what a shame it doesn’t have its own web site, but I may just do something about that myself). The park is about 12 minutes walk from where we live, so I did indeed walk over there, on a beautiful sunny morning with the thermometer at -1C. We were given a tour of the animal area, a nice talk on the various boats, and a stroll round the park, all preceded by a cup of coffee and a mince pie, made by the excellent ladies who run the very nice café. I walk round the park often, and now I am pretty much able to lead other people round, so that’s all good. In the evening, I cycled down to Queens Gardens, for a workshop with BBC Radio H umberside. They have obtained A Bus, which will be trundling around their coverage area all next year, outside broadcasting Monday to Friday between 12 and 2.30, and they need City of Culture volunteers to add as production assistants, and maybe do a bit of interviewing. It sounds enormous fun. 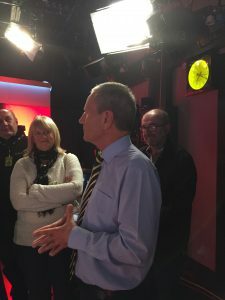 We had a tour of the studios, both radio and TV, and we met the famous Peter Levy, who has been presenting Look North for nigh on thirty years, and gets mobbed whenever he goes out! So, that was about 8.5 miles yesterday, on foot and by bike. You’d think I’d be getting fitter by now, really. Still, my trusty velocipede now has a new inner tube in its rear tyre, and air (such luxury), and is much, much easier to pedal. I am out seven days in the next eight, so stay tuned for more exciting stuff.